The recent heatwave has brought out my inner love of summery music. There is certain music that is designed for long summer afternoons, and for me that's either wall-to-wall Britpop or 'folky guys with acoustic guitars'. As the first rays of sunshine sweep away the grey winter - and this year, with a winter that seems reluctant to let go (as I write it's blowing a gale outside and raining at Wimbledon), we've needed it more than ever - certain artists start creeping back onto my iPod and Spotify playlists. It started with Jack Johnson and Newton Faulkner, then last year they were joined by Ben Howard and Michael Kiwanuka who soundtracked eight months of long bus journeys. 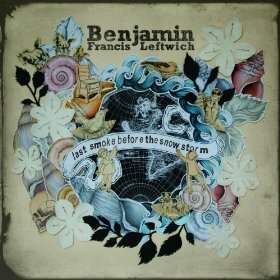 This year, there are three albums I intended to download before I went away and forgot: Bright Eyes' I'm Wide Awake, It's Morning; James Vincent McMorrow's Early In The Morning; and Benjamin Francis Leftwich's Last Smoke Before The Snowstorm. (For those of you playing along, the theme of this is mornings and middle names.) As Leftwich seemed to have flown under the radar in comparison to Bright Eyes, who have been around for years, and McMorrow, who shot to fame with his version of 'Higher Love', it only made sense to choose him for (what I think is) the first edition of What I Heard. Plus, he's a York boy - I went to uni there - so I couldn't not champion him. Last Smoke Before The Snowstorm is an absolutely gorgeous album. It's music for lazy mornings, for those days when you don't have to do anything and there are endless hours stretching out before you, for drives cruising down long roads (well, maybe if you live in California or have miles of Aussie motorway to eat up). The album is packed with beautiful strummed guitar melodies that just make me want to go outside and just wander aimlessly, like those perfume ads where the wavy-haired girl in the white dress is strolling through the waist-high grass and it's all perfectly lit, and when that's coupled with the twisty-turniness of his rhymes - something I always have a soft spot for in these kinds of artists - it's completely lovely and a little bit magical. It is indeed quite Bright Eyes-esque in a lot of areas, coupling jangly tunes with surprisingly dark lyrics that has become a bit of a hallmark for acoustic guitarists, and yet it doesn't sound dated. In fact, quite the opposite - the slightly retro vibe makes it feel like something I could whack on in five, ten, twenty years and it would still be a good listen. Standout tracks for me were 'Atlas Hands', 'Stole You Away' and 'Shine' - 'Atlas Hands' for its jauntiness, 'Stole You Away' for its slightly Eagles-esque backing track and 'Shine' for pure sing-a-longability (I can quite easily imagine a crowd swaying to it in a tent at a small boutique festival). Admittedly the songs do merge into one another after a point, as acoustic guitarists are a little wont to do, but I'm not entirely sure that's a bad thing, especially for a debut. It's a calling card, after all - you're trying to say 'this is who I am' and a consistent musical style helps with that in my book. Save the experimental stuff for when you're a bit more established. That's not to say they're samey by any means though. It's not going to rock the world by any means, but Last Smoke Before The Snowstorm is a solid whimsical debut album of gentle melodies and lyrics that are poetic in a slightly teenage way, and it has found its way onto my summer playlist. I'll definitely be listening to this when I'm sitting in the park on warm sunny days - if we get any more of them, that is. If you fancy checking this album out it's available on Spotify, or £4.49 for the MP3 download on Amazon and iTunes - iTunes includes a bonus track (and two videos, although I'm less bothered about those) so I'd go for that version.